Change can feel forced on us, I say embrace it, there's nothing we can do to stop it. 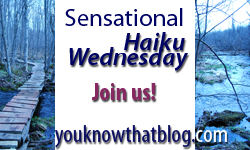 Super Haiku Wednesday! It seems our haikus are opposite today. It sure can... I'm glad, for me, that is not the norm. Oh how right you are!! Change is good usually though. I look forward to a year of changes. Big ones. Roll with the changes, I say!